Server Sprawl and escalating IT costs have managers and system administrators scrambling to find ways to cut costs and reduce Total Cost of Ownership of their physical infrastructure. Combining software applications onto a single server, even if those applications are from the same software vendor, can be dangerous and problems hard to troubleshoot. Virtualization allows you to consolidate many servers onto a single physical server reducing hardware, electrical, cooling, and administrative costs. These virtual servers run completely independent of each other so if one crashes the other are not affected. Planning and implementing a server consolidation is a complex process. This book details the requirements for such a project, includes sample forms and templates, and delivers several physical to virtual migration strategies which will save both time and costs. 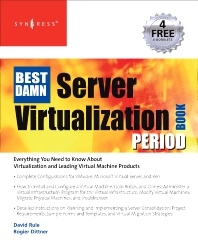 Readers of this book will easily be able to plan and deploy VMware, Microsoft Virtual Server, and Xen.